To be at par with the developed countries, India needs to implement information technology extensively to bring liability and clarity in the system and to make the operations more efficient. It is no more a matter of choice but an utter need in modernizing the nation. E-Governance is the implementation of information technology for sharing government services between citizens, business persons, government, and employees. India has adopted E-governance as a tool for good governance. Today, e-governance is implemented by the government in almost every field from rural areas to urban states. Practical application of E-Governance helps in reducing the cost of operations for the government and increasing the ability of citizens and businesses to access public services in an effective and cost-efficient manner. Here is a quick glimpse of the major challenges and trends that prevail E-Governance in India. E-Governance in India faces following economic, technical and organizational challenges in its implementation. The main issue with implementing any new system in India is with people not feeling comfortable and not finding it trustworthy. The implementation of any public administration functions through e-Governance requires support and confidence from the public for using the technology. The public does not trust the technology they are interacting with as it involves their personal and confidential information. The government needs to ensure that the system would prevent fraudulent transactions and provide security to their information. In an economically developing country like India, implementing e-governance is a tough task as the price plays an obstacle in the process. The implementation, operation and maintenance process involves too much of cost for the elected officers to decide to adopt and execute it. To impose e-governance in India, the elected officers need to invest a good amount on it. Privacy concern is the most apparent in any process where an individual’s personal data is being involved. E-governance acquires all necessary personal data of people but lacks a system that helps in protecting sensitive personal information of every individual. The data includes medical history, income and other confidential information of people and hence effective measures should be taken to implement privacy and security to it. Lack of Information Technology literacy is another major challenge that comes in the way of implementing e-governance in India. There is very less knowledge and awareness regarding the benefits of e-governance and the procedure for applying it. For successful adoption and implementation of e-commerce, people of India need to be made aware of the usage of Information Technology. Maintaining and up keeping the machines and devices associated with the technology is a key factor for extended living systems in a rapidly changing technical environment. As the trends in information technology changes very fast, it is hard to keep updating the system constantly. Characteristics and standards of different devices may vary with time and the system in use must be able to handle all the emerging needs. For this, there must be a proper system that keeps a check on the appropriate working of all electronic devices. E-Governance aims at uniting information, processes, people and technology for achieving good governance. Earlier, Information Technology alone was the key system that was used in India for e-governance. 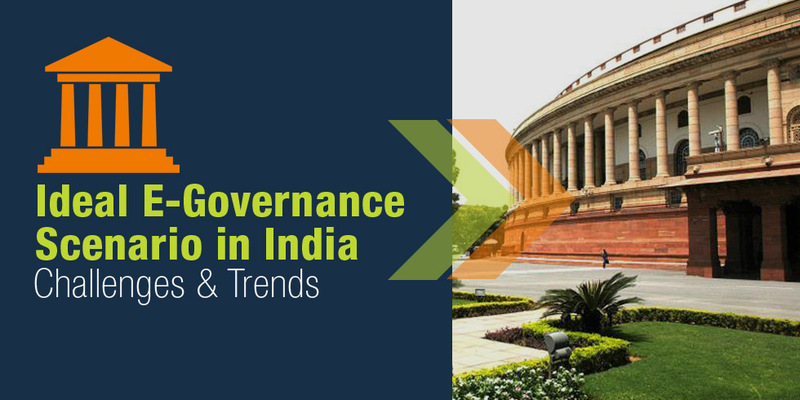 With time, e-Governance trends have changed. Today, Information and Communication Technologies (ICT) and Information Systems (IS) are the primary tools that drive e-Governance. These technologies increase transparency, efficiency and responsiveness to citizens of the nation. The ICT provides a platform for new digital connections and provides support to the governance by transferring and processing data. With this, we have made clear the significant challenges and trends in e-Governance in India today. Semaphore Software provides effective custom software solutions in the field of E-Governance. For all your business needs related to this industry, write to us at info@semaphore-software.com to learn more about our capabilities.